Beautiful set! We love the unique octagon shape of the table and the quality is great. 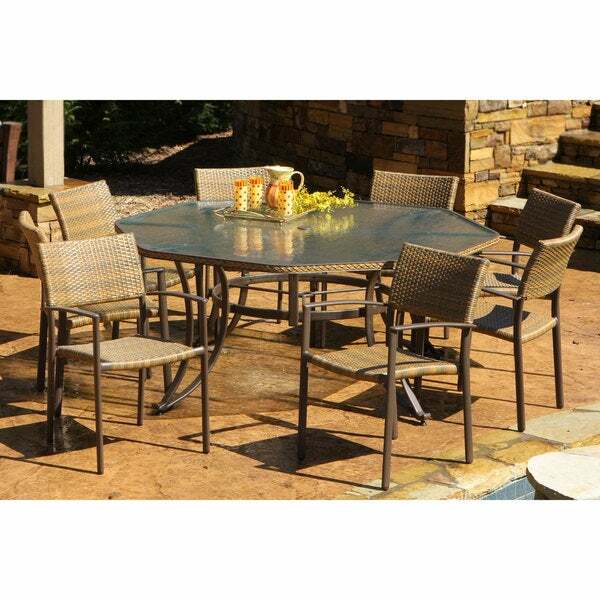 Bring an intriguing geometric design to your back yard lounge with this 9-piece outdoor octagonal dining set from Havenside Home. Constructed of powder-coated aluminum and all-weather resin wicker, this table features stackable chairs for easy storage. Pair with vibrant red, orange, or gold tones to bring your back yard to life. "What is weight limit for chairs"
"what size umbrella does this table need to cover seating area?"